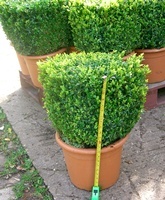 Buxus sempervirens (common box) cubes make superb specimen topiary plants. 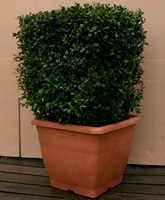 Box topiary cubes can be grown in containers/planters or in the ground as specimens plants. Each box cube can be repeatedly trimmed to the same size and shape, or can be allowed to grow to a larger size by trimming the new growth to within about an inch of the previous trimming point each year or two. Box cubes can be grown in containers or in the ground. Plants in containers will need feeding, either with slow release fertilizer granules, ordinary granular fertilizer or liquid feed. Topiary cubes grown in the ground will grow well with less care than buxus topiary in containers or planters.